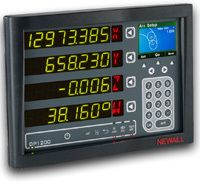 Newall's Digital Readout (DRO) Systems offer exceptional value with leading edge technology and productivity enhancing features. Designed for use with the Spherosyn™ and Microsyn™ linear encoders, Digital Readout Systems by Newall are well known for providing the best solutions for any machine application. With rugged die cast chassis and wipe-clean front panels, Newall DRO Systems are built to last. The DP700 was designed for all types of machining applications such as milling, turning, boring and grinding. The DP700 digital readout is a powerful yet intuitive DRO that includes a host of standard features that are normally found on more expensive units. The DP700 digital readout sets the new standard for performance, value and ease of use. Milling, grinding and turning packages are available. Available in 1, 2 and 3 axes.